Collection theme: Debarun’s interpretation of divinity and the omnipresent Almighty. Inspirations: Iznik tiles of Turkey for the texturing and embellishments. What to expect: Fusion Indian silhouettes (flared, layered and dhoti-inspired skirts) and saris for women. Sherwarni with flair and shirt kurtas for men. Cobalt blue mixed with beige- loved the combination! Layering with prints, embellishments and accessories. Watch out for: Mix of print and embellishments and playing with textures. If you’re Bollywood inclined, you’d be happy to see Richa Chadha as the showstopper. 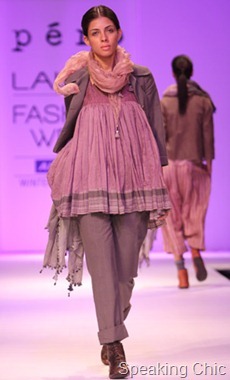 On the closing day of Lakme Fashion Week Winter/Festive 2011, Aneeth Arora artfully used fabrics from across India for her trademark layered creations. 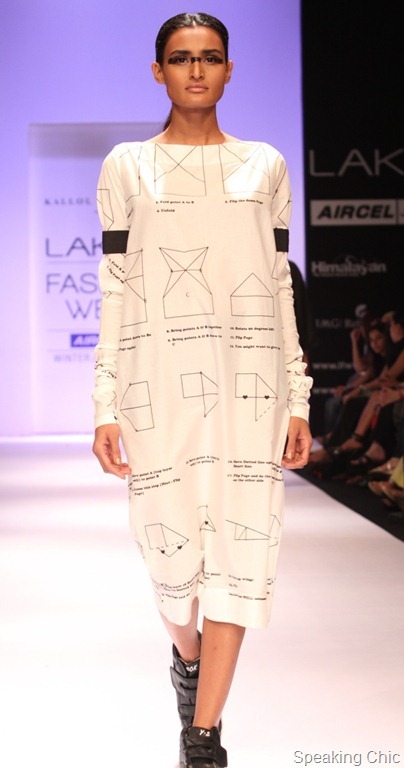 Meanwhile, Kallol Dutta showcased geometry in his collection in more ways than one. 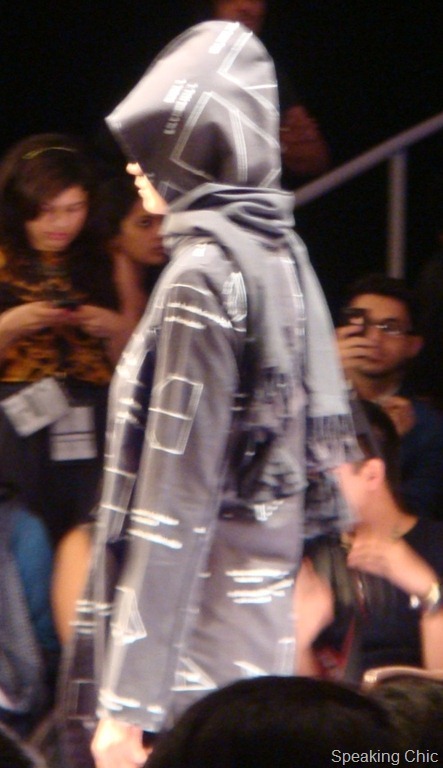 Aneeth Arora’s collection at LFW W/F 2011 was an advanced lesson in mix-and-match. 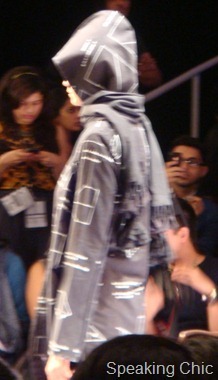 She mixed fabrics, silhouettes and colours as she layered a whole range of garments in her show. 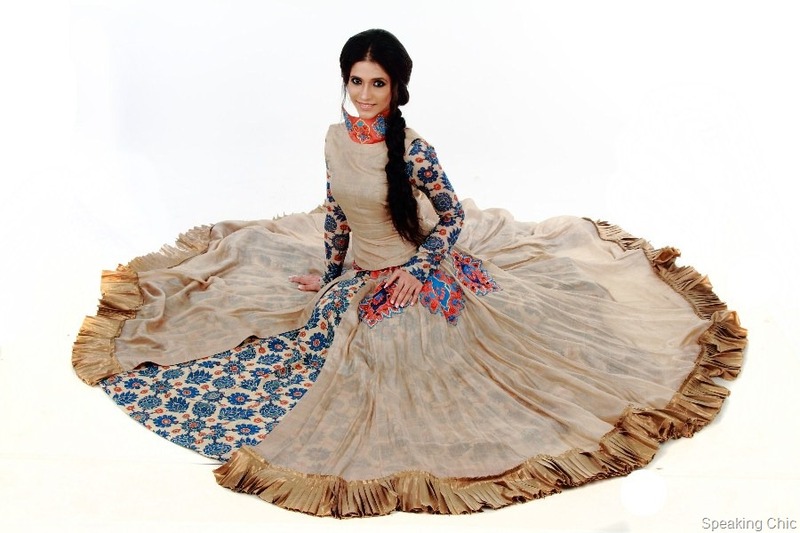 The young designer highlighted the skills of Indian weavers, using fabrics from different regions of India. It wasn’t just her favourite khadi that we saw, but also kota, doria, chanderi, linen and wool, all expertly layered for cooler weather. She mixed textures and silhouettes from the onset—the opening model wore a crochet baniyan with a khadi skirt, chanderi shirt and jamdani scarf. We enjoyed the choice of colours, that included peach, lilac, wine, ash, brick, rose and military green that were fused together as simple shirts, structured trousers, jackets, jumpsuits, and even shrugs and overcoats. While layering is not new to Aneeth Arora or to the fashion world, we noted that this clever layering was something we could keep in mind for next summer as well. The word “unconventional” best describes designer Kallol Dutta, and while his colour palette is usually monotonous, his outfits are striking and impactful. 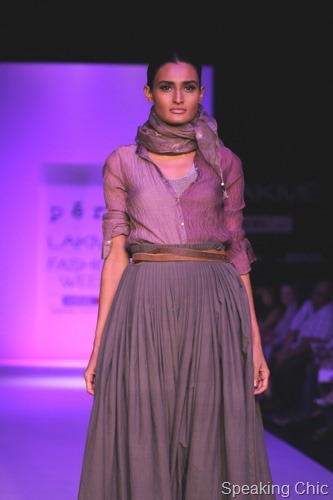 In a seemingly simple collection, Kallol gave his own twist to simple garments like jackets, dresses and trousers. The prints were seemingly taken from a high school geometry book, and detailing like braids, tiny pleats, frayed edges and tassles made all the difference. Kallol used wool, wool blends, silk, satins, nets, voiles, kora silks, gauze and calico in black and white (with hints of blue and pink) for garments like palazzo pants, multiple hoodie, disjointed waistcoat and askew dress. Yes, unconventional is the right word for Kallol Dutta. We could also add quirky, crazy and out-of-the-box to the list.